Disclaimer: Gale Force Nine kindly provided me with a review copy of Spartacus. Three friends came over the other night to try out Spartacus: A Game of Blood and Treachery—and if ever a game lives up to its tagline, this is it. There was blood and treachery aplenty, along with a goodly amount of laughing and gloating. If you’re a fan of gladiatorial combat, sneaky deal making and breaking, or just enjoy the TV series on which this game is based, you’ll love this rip-roaring boardgame. 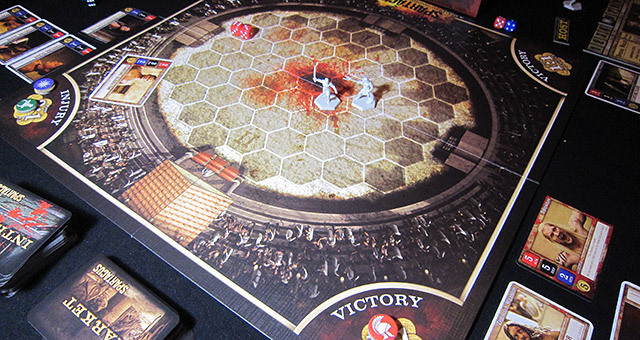 Spartacus crams in plenty of over the top violence, backstabbing and scheming by cleverly blending two styles of game. One is a card-based ‘take that!’ game of playing schemes on your opponents and roping in other players to support you; the other is good old fashioned dice-driven combat in the arena between gladiators (and occasionally, poor house slaves). The two styles sit comfortably together, held together by some blind bidding and a flexible framework of relatively unrestricted player interaction: you can buy and sell cards, exchange gold in return for promises, and generally make whatever deals you think will get you ahead. A game round begins with the Upkeep phase, in which players refresh exhausted cards, roll to heal any of their injured combatants, pay bills and receive income. This is followed by the Intrigue phase, in which all players draw 3 new Intrigue cards, then take turns to play schemes and/or cash them in for gold. Each scheme requires the player to have a minimum influence level (this level also determines your hand size), but you can make deals with other players to add their influence level to your own, in return for promises or gold. However you don’t have to reveal your scheme, so it can be great fun to promise something and then deliver something else—or nothing at all. Players may be able to play reaction cards to foil a scheme directed at them, or use a Guard card to do the same. In the Market phase, players bid for 4 Market cards in succession by blind bidding an amount of gold held in their fist over the board. Then players bid to get the hosting honors for the upcoming games. Not only does the host automatically get one influence and become the first player, but he determines who fights whom in the arena this round, so it’s an important position worth saving some gold for. Next is the Arena phase, when the Host invites two players to fight in the arena. These players, if they agree—and a player who rejects an offer loses influence—choose one of their combatants (a slave or, preferably, a gladiator) and his equipment. 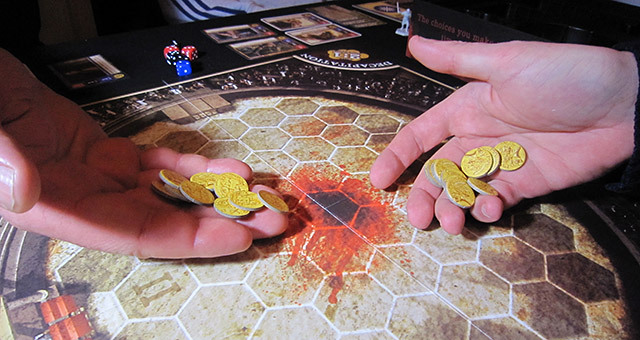 The participants place their gladiator figures on the board, all and players may make wagers of one to three gold on straight wins, and/or results of injury and decapitation. Combat is then joined. Each combatant has three dice pools: attack (red dice), defense (black dice) and speed (blue dice). 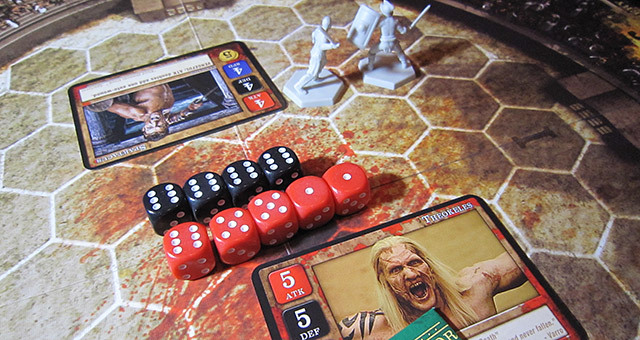 The speed dice are rollowed to determine initiative in the combat round. A combatant can move equal to their number of speed dice then attack, or attack then move. An attacker rolls his attack dice pool, the defender rolls his defence dice pool, and the two groups of dice are lined up facing each other from highest to lowest in results. Each attack result higher than a defense result inflicts a wound, as does each uncontested attack result of three or higher. Any wounds translate to discarded dice from a pool of the defender’s choosing; in this way your combatant rapidly loses his ability to fight in the arena as he is wounded (and an effective first hit can be decisive). Cleverly, you cannot reduce a dice pool below zero until all dice pools are reduced to one die. Depending on how many dice pools are simultaneously reduced to zero, the defeated combatant may be forced to yield, be injured, or be decapitated. Finally, the host decides the fate of a non-decapitated combatant with the traditional thumbs up or thumbs down gesture; usually taking the opportunity to have his decision influenced by bribes! Combat is fast and fun. I managed to get a powerful gladiator early in the game, Theokeles, and was going up against The Thing in the Pit, when an opponent played Rigging the Match on me and I had to substitute a far less worthy fighter who was quickly decapitated. I then took great pleasure later in the game sending Theokeles against The Thing and wreaking a bloody revenge! Since your gladiators can obtain favour for winning matches and even become champions, you soon become attached to favourite fighters and equipment combinations, which gives them real personality. The first player to reach 12 influence wins the game, and ties can often result in a final round or rounds of arena combat to determine the final victor. After the game I canvassed the opinions of my fellow gamers, all of whom very much enjoyed the game and looked forward to playing it again. The final scores were 7½, 8 and 8½ out of 10, and I gave it an 8½. We all agreed that the intrigue deck would benefit from some cards with higher influence costs, in order to force players to make more ‘expensive’ deals and increase the interaction, and there was some slight concern that the first hit in the arena could often be decisive. Despite these minor quibbles, Spartacus: A Game of Blood and Treachery was a big hit. The production is excellent, and I was pleased to see a good plastic box insert so it won’t be necessary to design one out of foamcore. Not only does the game capture the feel of the TV series perfectly, but it’s exactly as advertised on the box: there will be blood, and there will be treachery—just remember to shake hands and remain friends when the victor is crowned! I’m definitely going to get my hands on the expansion, The Serpents and the Wolf, which adds two new houses, new schemes, reactions, slaves, gladiators and equipment; plus team fighting in the arena. You can find my rules summary and reference for the game here. Good review, nice rules summary sheet, and what a great site! When you get your hands on the expansion, you’ll need to do some of your foamcore magic, if you want all the components in the original box that is. There’s a lot of dice and cards in that one! Thankyou on all counts! I might create an insert for the expansion box—I’m not sure I could abandon that lovely plastic one in the main box. I especially like the large round well that you can put all the gold tokens in. Very fun game with just the right amount of complexity for my limited attention span. I understand the reasonably priced expansion adds a lot to the base game. I’ll write up something about it as soon as I get my mitts on a copy and have a chance to play it.